A cookie is a piece of text stored on your computer by a web server. This value of a variable that a website sets. If the lifetime of this value is set to be longer than the time you spend at that site, then this string is saved to file for future reference. Cookies were developed to help users to navigate visited sites. But often cookies criticized for weak security and inaccurate user identification. You can read more information about cookies from Microsoft or Wikipedia Web sites. 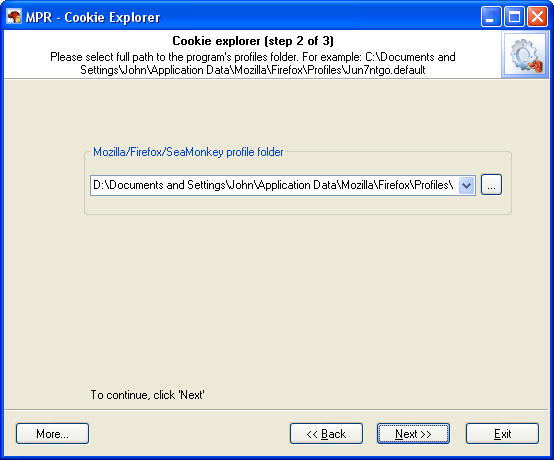 Cookie Explorer is a new feature that was added to MPR v2.4 to help you to navigate through the Mozilla/Firefox/SeaMonkey stored cookies. To start viewing cookies, you'll have to show a full path to your Mozilla/Firefox/SeaMonkey profile folder (a folder with the cookie.txt file in it). After selecting a profile folder from the drop-down list, click Next to view the cookies.